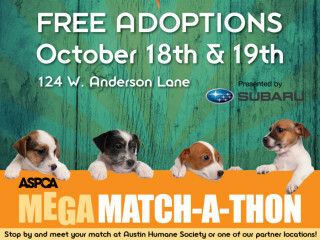 The Austin Humane Society and the Austin Animal Center are hoping to find homes for more than 325 animals over the weekend of October 18 and 19 during the Mega Match-a-thon adoption event. All adoption fees for dogs, cats, puppies and kittens will be waived. AHS and AAC will cover spay/neuter surgery, leash, collar, ID tag, microchipping and vaccinations for each adopted pet.